Well, I’m up to 750 photographs taken in five days. 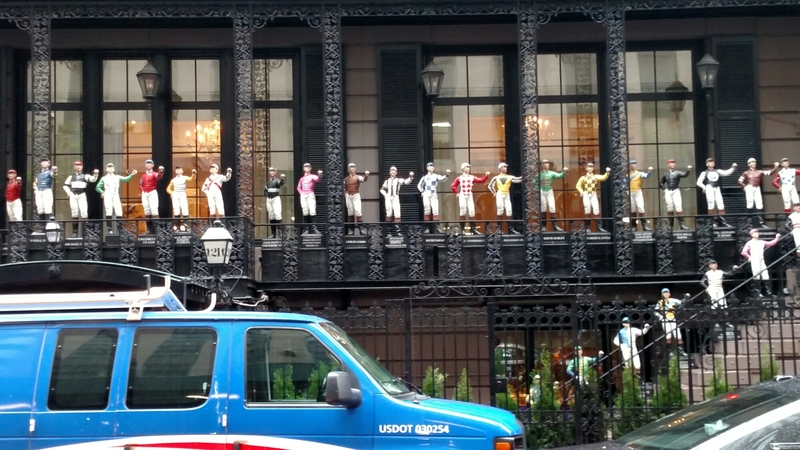 There is so much unbelievable eye candy in New York, and I’ll bet the people who live here don’t even see it. It’s been great being able to share these pictures and experiences instantly with people back home. It’s like having travel companions, and makes up for the fact that I don’t. Everyone’s comments have been great – thank you for following along as armchair travelers. 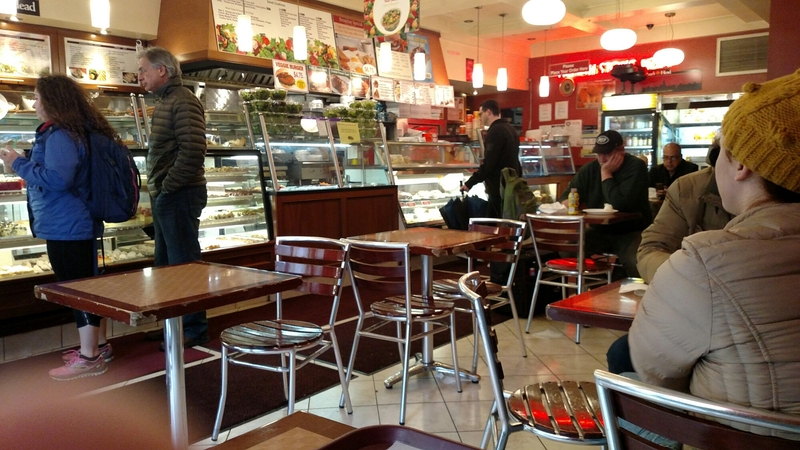 I started my day as usual, having breakfast at the bagel shop around the corner. I’m starting to become a regular there. 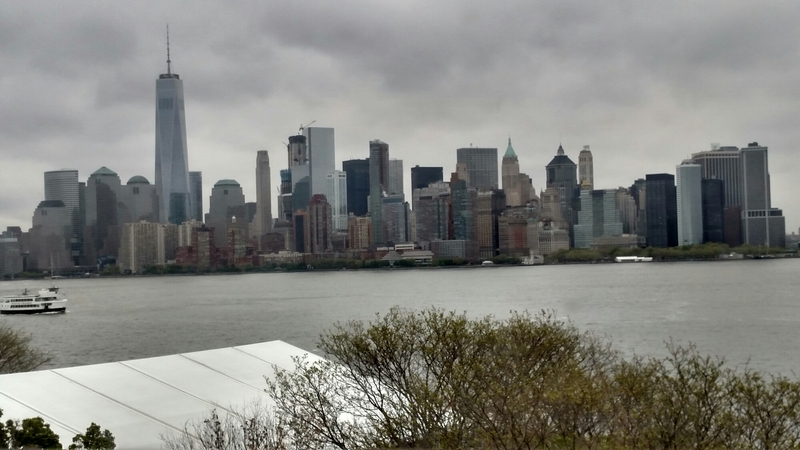 Then, since it was raining – again – I decided to make it a museum day and visited the Museum of Modern Art. This museum is spread out over six floors. I wasn’t very interested in the bottom four floors, and was starting to wonder if I’d wasted my money. Plus, the place was incredibly crowded. It reminded me of being in a supermarket the day before Thanksgiving, but I had no carriage to ram anyone with. It was hard to walk through the exhibits, and even harder to find a place to sit and rest (museum browsing can be exhausting). Then I discovered that they keep the good stuff on the top floors. 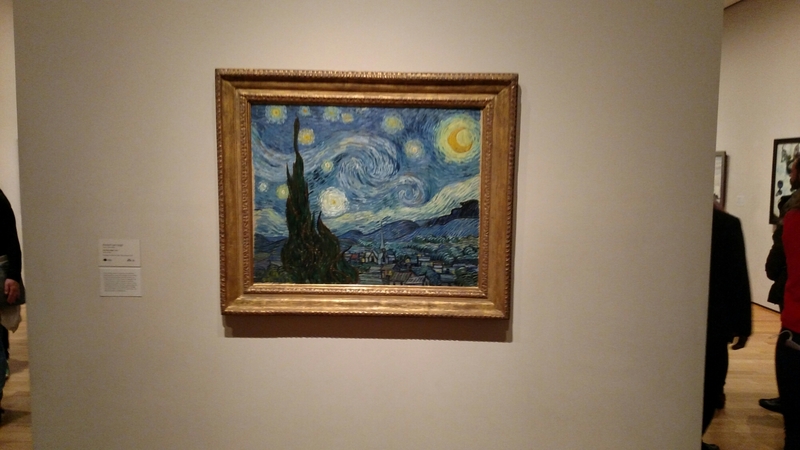 The upper floors had some prize pieces, like Van Gogh’s Starry Night and famous works by Degas, Cezanne and Matisse, among others. Even a relative art neophyte like myself knew and appreciated these works. I tend to be drawn to the especially colorful pieces. That probably gives me the art acumen of a two year old, but hey, I know what I like. And there were a few works that convinced me that just about anything can be called art, and anyone an artist. And that’s okay. 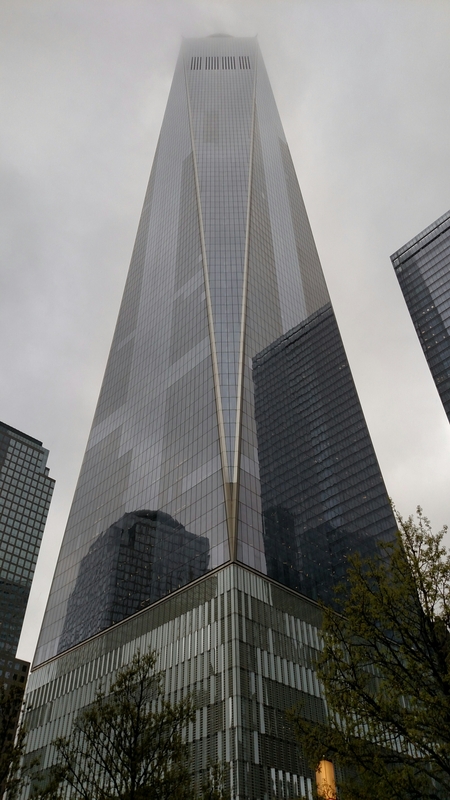 Next, I headed way downtown to the National September 11th Museum and Memorial. Wow. What a place. I’ve never been one to get overly sentimental about September 11th, but the symbolism and detailed chronicle of that fateful day here is astounding. I don’t think I could have been more impressed. It was informative. It was poignant. It was tasteful. It was dignified. That there was so much controversy surrounding it kind of surprises me, because the end result is absolutely fantastic. 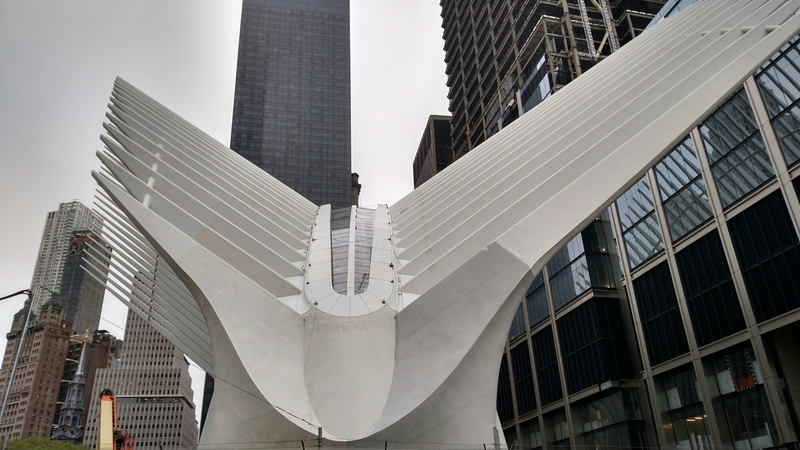 Above ground, as you approach the site, there is a massive white sculpture that resembles wings, perhaps those of a dove. It is elegant and striking (it, too, was controversial). 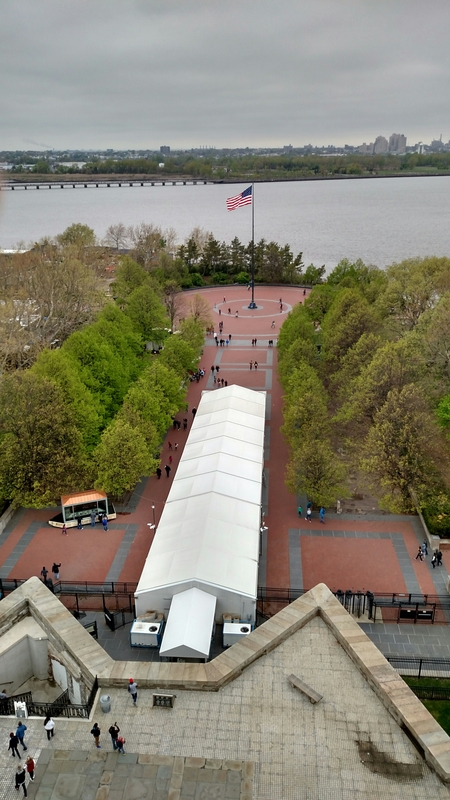 As you walk further into the site, there is a sizable plaza populated with newly planted trees that surround the memorial pools. 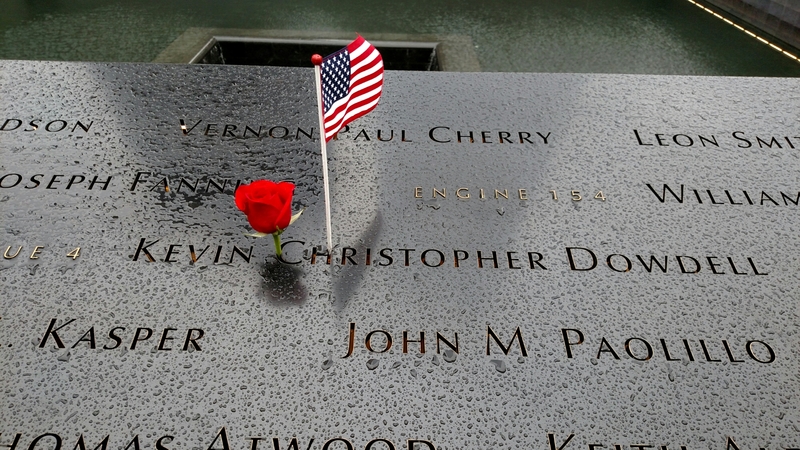 The pools – there are two of them – occupy the exact footprints of the Twin Towers, each an acre in size. Water cascades downward from all sides into a central abyss. Surrounding the pools, the names of every person who died in the tragedy are carved in metal and backlit from underneath. 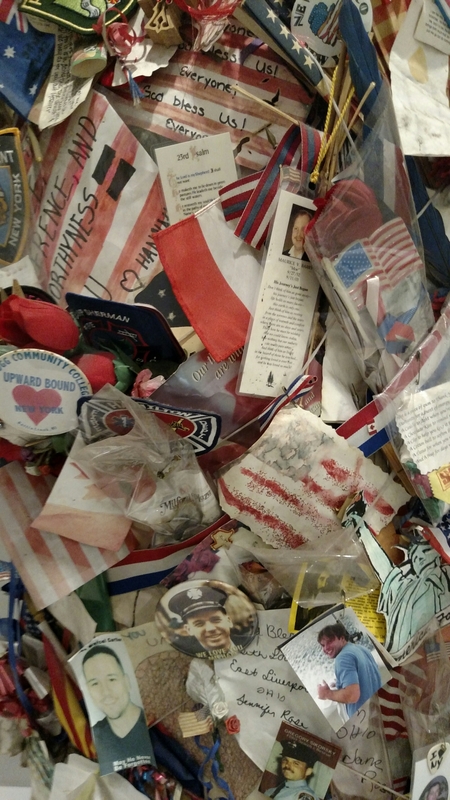 Many of these names have flags, flowers and other mementos left by loved ones in remembrance. The museum itself is completely underground and goes down several stories, essentially occupying the same space that the Trade Center’s underground sections did. The space is cavernous. 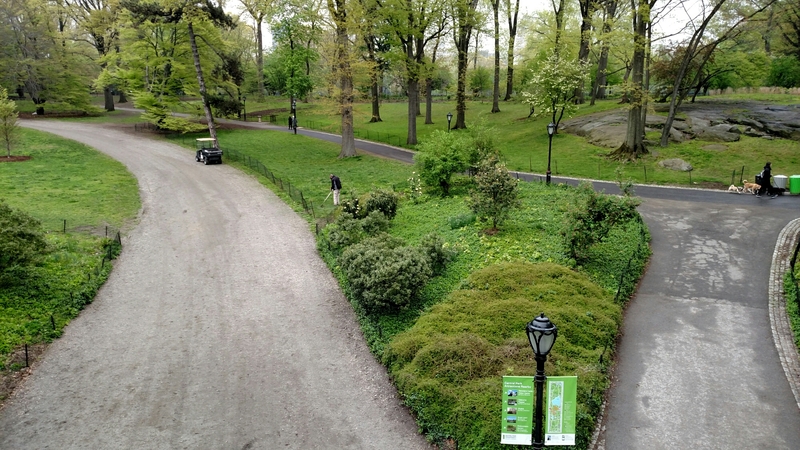 You can listen to an audio tour on your smartphone explaining each exhibit. 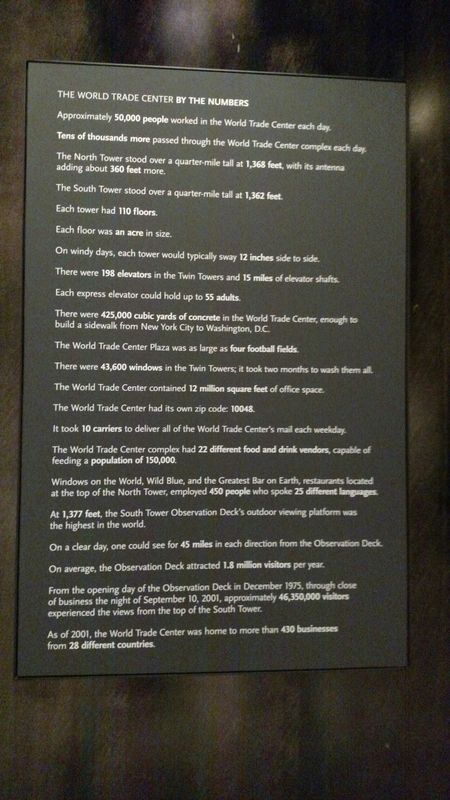 Many of the exhibits are educational in nature, detailing the events of that day (many today are too young to remember) in the words of the people who experienced it – the rescue workers, the eyewitnesses, the news anchors, and some of the victims themselves via final phone calls made from the plane. 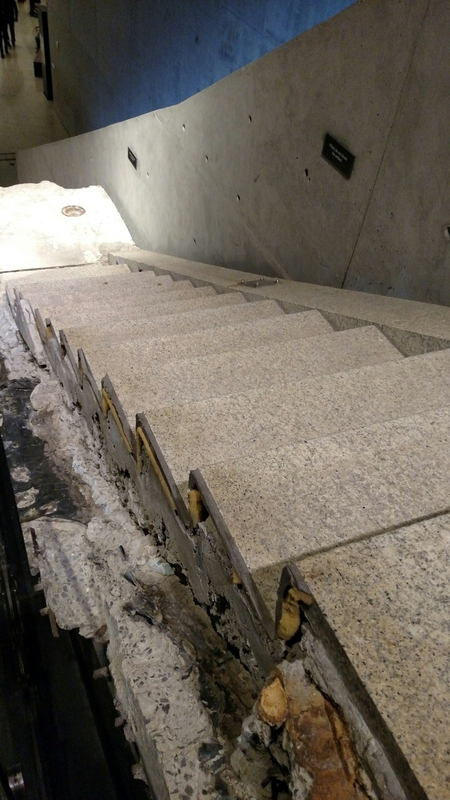 There are also many relics from the tragedy – pieces of the building, pieces of rescue equipment, even one of the staircases that proved to be a lifesaver and allowed many people to escape to safety. One of the most moving parts of the museum for me was a large art installation called Trying to Remember the Color of the Sky on that September Morning. 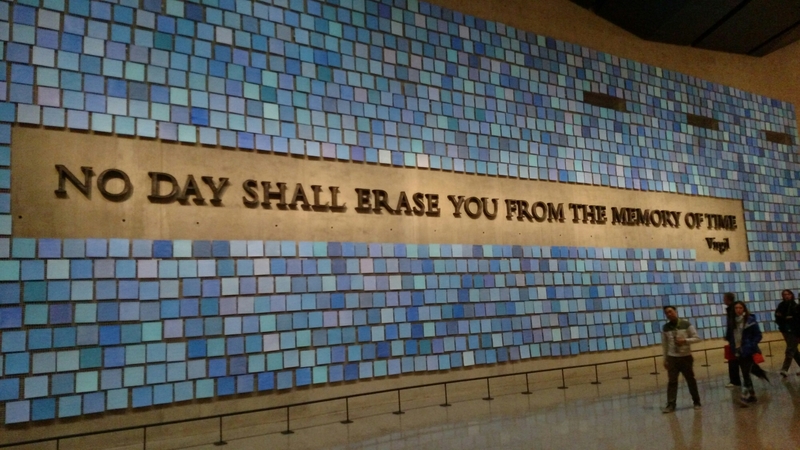 It consists of almost 3,000 panels – one for each victim – in a different shade of blue. 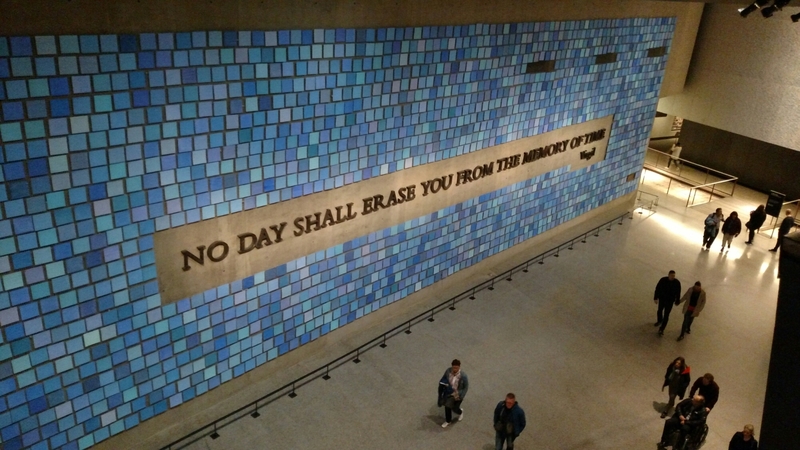 Spanning these panels is a quote from Virgil, the letters of which were made of steel from the wreckage: “No day can erase you from the memory of time.” Behind this wall are the remains of many victims that could not be recovered. In an equally moving exhibit is an 8 x 10 color photograph of every single victim, arranged in neat rows and columns, covering four massive walls. Deeper within this area is yet another, darkened room with a glass floor and benches along all four walls. Projected on the walls, one at a time, is the name of each victim, which is also read aloud. A little bit of their life story follows, as well as their picture and audio remembrances from loved ones. Together, these two exhibits put a very personal face on this unspeakable tragedy. Out of respect, photographs were not allowed in this area. There was much to absorb at the Museum, and it would really take the entire day to examine every exhibit ( I spent three hours there, and by the end of that was a bit overwhelmed). In some sense the museum is also a library, containing far more information than can be absorbed in one visit. 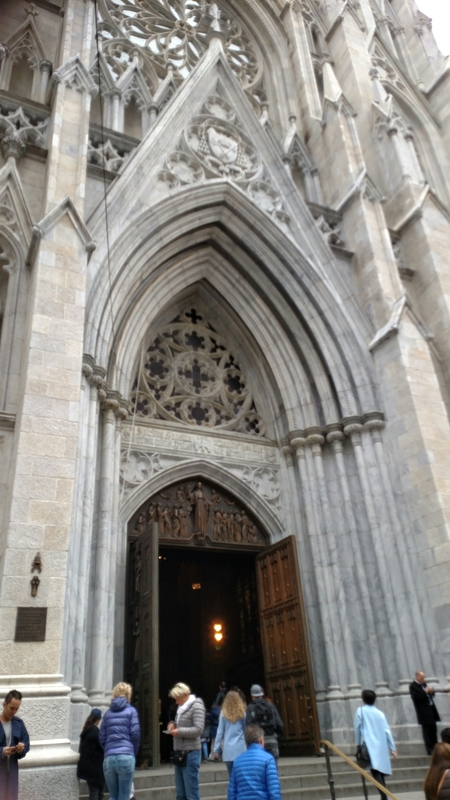 It was a moving experience, and I would recommend it to anyone visiting New York. 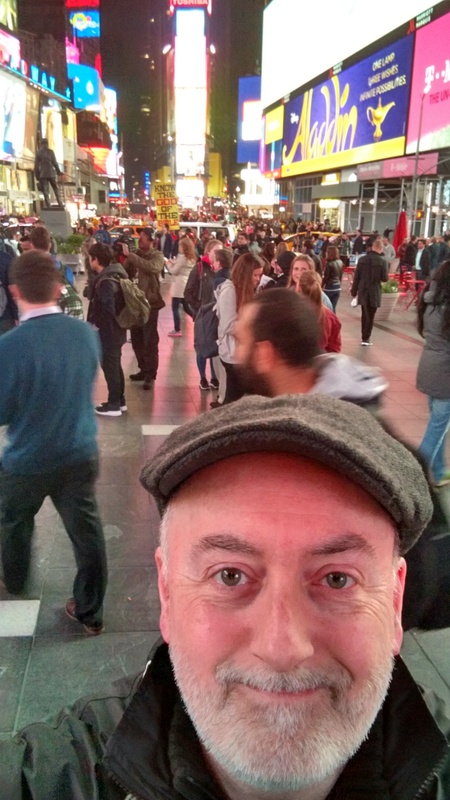 After my visit to the museum I headed back uptown, hoping to go to the top of Rockefeller Center and take in the breathtaking nighttime view of New York City. Unfortunately, it was very overcast tonight and the view from that height was non-existent. As this was my last night in New York, this is one of the few things on my bucket list that I was not able to accomplish on this trip. So instead, I absorbed the nighttime ambience of Rockefeller Center and headed back to my hotel room for my last night in the city. 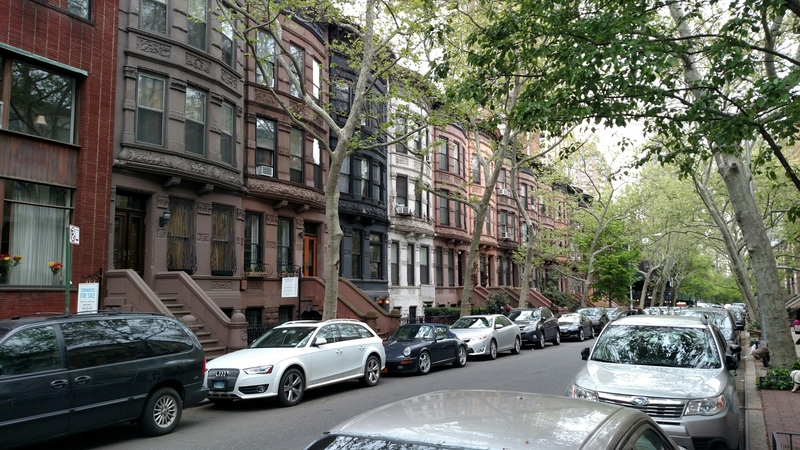 Tomorrow I may visit Brooklyn, and I will follow my wrap-up report on the train ride back home. 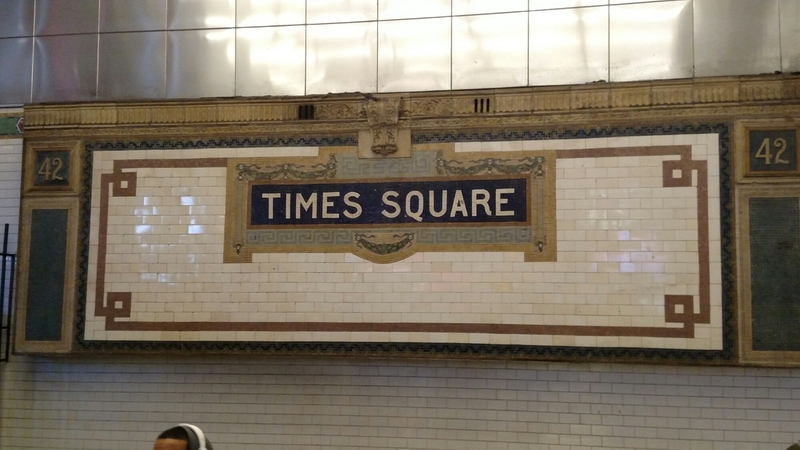 Ah, New York, where everything is big and old and somewhat grimy. Where clerks treat you like you’re kind of annoying, but hey, it’s their job to wait on you. Where pedestrians talking to themselves on the street aren’t crazy, they’re just on the phone. 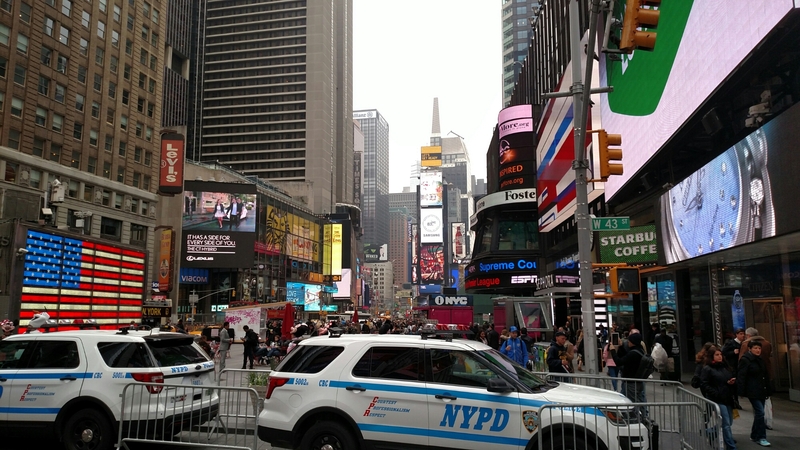 It’s boisterous and crowded and expensive, and one of the most fascinating cities in the world. Spent the day wandering around Greenwich Village, Chelsea and the Garment District. 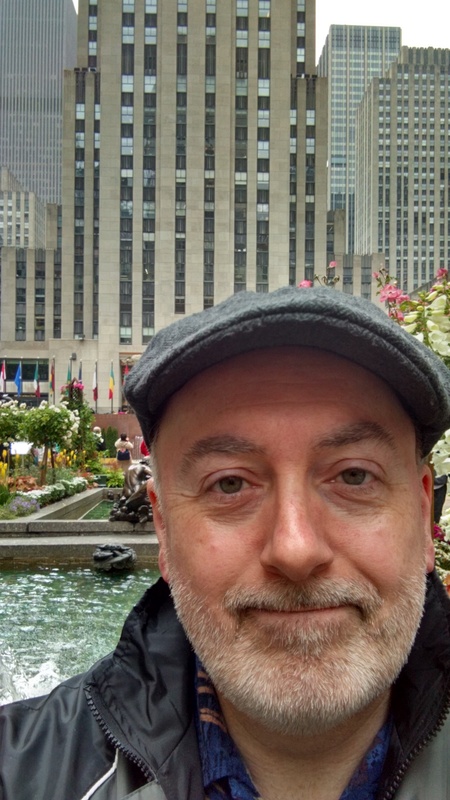 Admired the Empire State Building and especially the Flatiron Building, and spent some time in Herald Square and Madison Square Park. I’ve been walking quite a lot, (though I bought some cushy socks today that put an extra bounce in my step), so any chance to sit and be in nature (and there are some great parks here) is a good thing. Not a terribly productive day, but the weather was rather nice and it was a good chance to absorb the ambience of the city. I did get a little disoriented walking the streets, as the grid pattern that I’m used to is rather chaotic in lower Manhattan. I also managed to hop on the wrong subway on the way back, ending up in Harlem. Oops. After some wandering, map consulting and head-scratching, I figured it out. 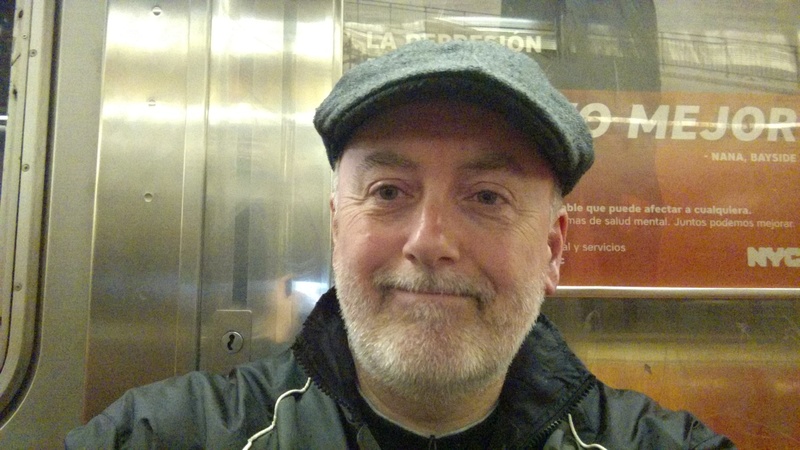 At least I wasn’t as confused as another passenger, who seemed to think she was on Metro-North (um, that’s a whole other train company), nor did I have the train doors close on me, making me a subway sandwich (ha!) like a third passenger. How embarrassing! I did, however, manage to bang my head a time or two on the handrails when getting up from my seat. This is one reason I wear hats. 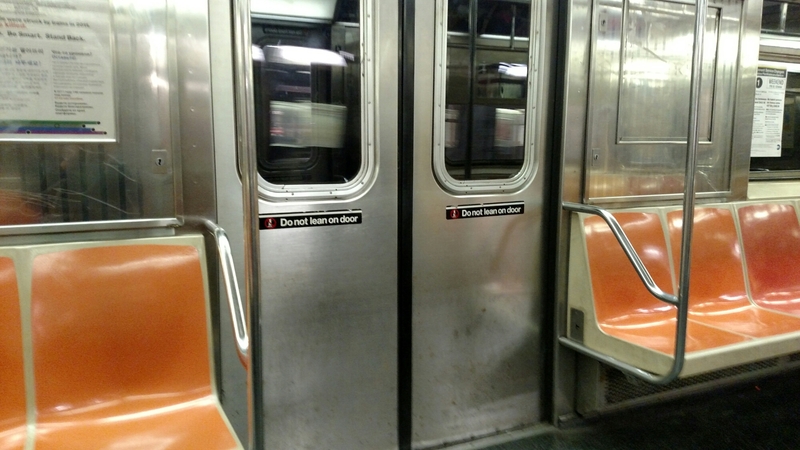 I discovered that there are different classes of subway cars on different lines. Some of the ones I rode today seem to be the Cadillac models, much more updated and contemporary-looking, with modern electronics and lots of information to tell you what the upcoming stops are. 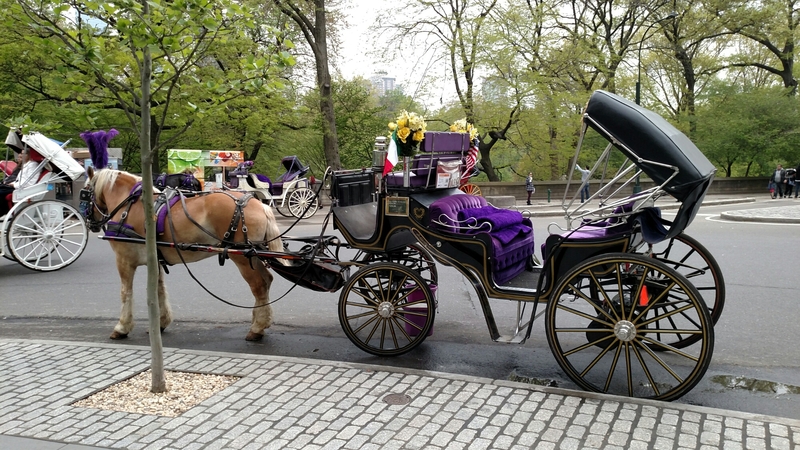 And here I’ve been riding coach most of the week! I also discovered that trains only go in one direction on particular tracks (uptown or downtown, and it’s important to note that distinction). Duh! I should have had that one figured out days ago. You know you’re seeing a first-class production when the audience applauds the costumes, set and scenery when the curtain rises, before anyone even sings a note. Among other things there was a donkey, a marching band, and snow on stage, along with a cast of dozens. Zefferelli knows how to impress. When I went to get on the subway at Lincoln Center after the opera, there was a street performer playing this very tune on his saxophone, which made it sound even more somber. Smart guy. I threw him a buck. 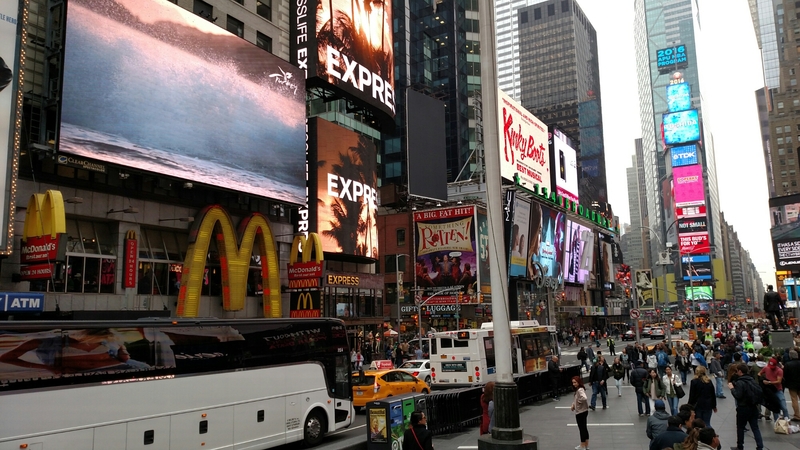 I then headed down to Times Square, which I had only visited during the day (this trip). Quite a different experience at night. 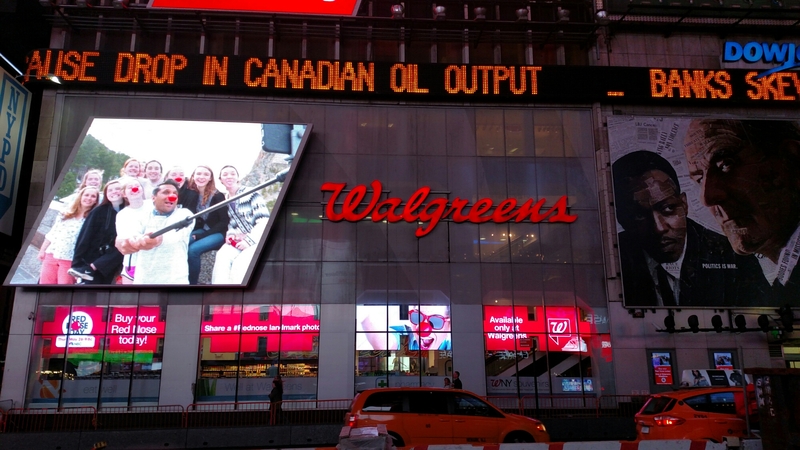 The billboards have gotten bigger and brighter, lighting up the square like it’s daytime. The whole area is much cleaner, safer and more tourist-friendly then it was when I was here years ago. They’ve installed a no-cars pedestrian area, bleachers, and lots of places to sit and soak it all in without worrying about getting hit by traffic (which I’m sure used to happen). They’ve really done a nice job with it. 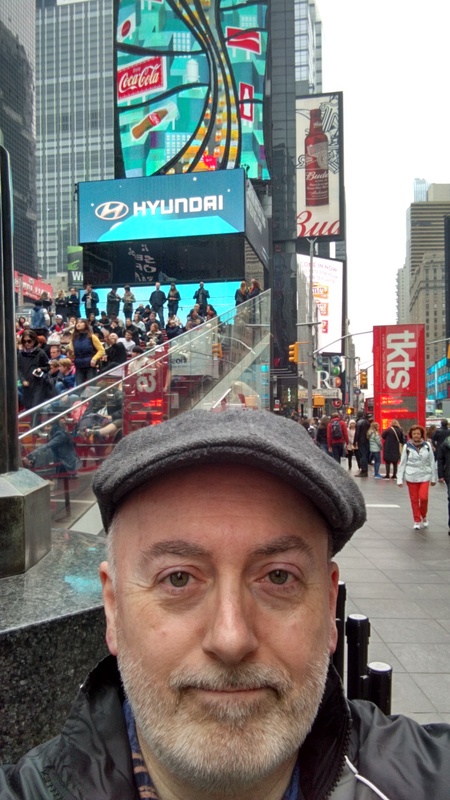 While I was there I finally stopped in the Times Square flagship store of my employer. I was not at all impressed. While it’s spread out over three floors, it felt very small and cramped (like much of New York) and the layout was a bit strange (well, the building is narrow and triangular, but hey, we wanted it for its prominence and history). There were many employees on hand, even at midnight, but not a one of them said hello to me (this is a standard requirement of our staff nationwide, but this is New York, where it’s OK to ignore the throngs of people that are everywhere). I bought nothing. On the ride “home” I practiced my nonchalant subway gaze – the one where you dart your eyes around the car dispassionately without really looking at anyone for too long. I’m getting quite good at it. Maybe by the end of the week, I can pass as one of them. 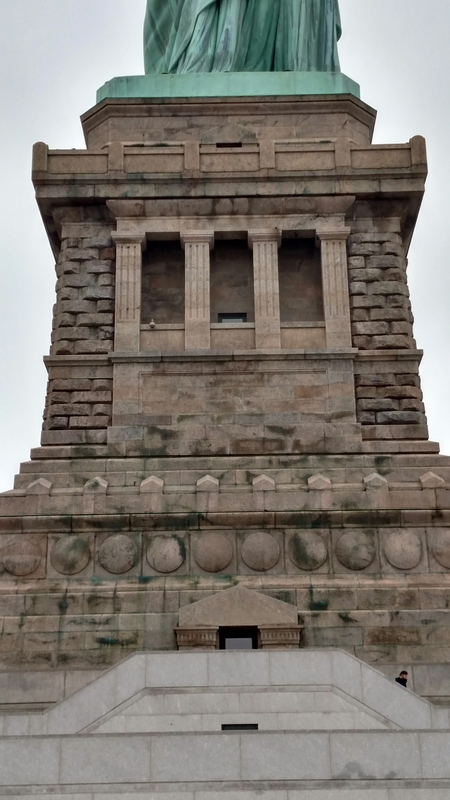 Today I acted like a true tourist and visited the Statue of Liberty. I had been to the Statue many years ago, but felt the need to go again. It’s such an inspiring symbol of American greatness, and the best piece of eye candy we possess. I noticed when I was there today that people can’t stop looking at it even if they’re walking away from it. It’s disrespectful. 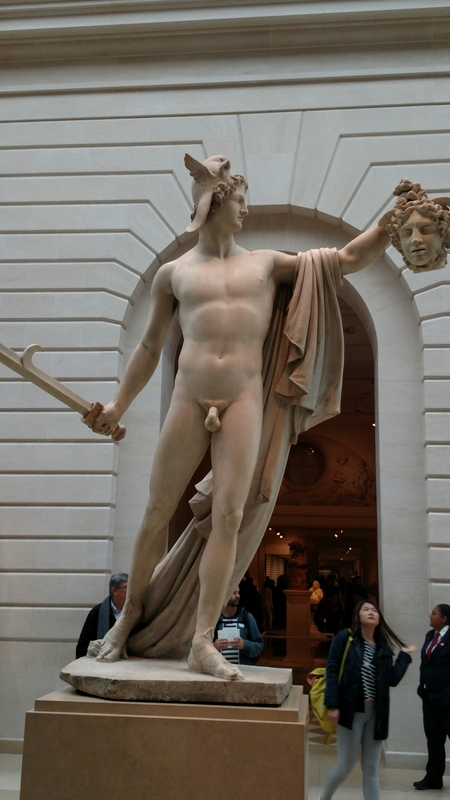 They turn around to catch another glance, maybe to see if it’s really still there or maybe they just can’t believe that they’re actually standing in front of the American version of the Colossus of Rhodes. Pinch me, I must be dreaming! 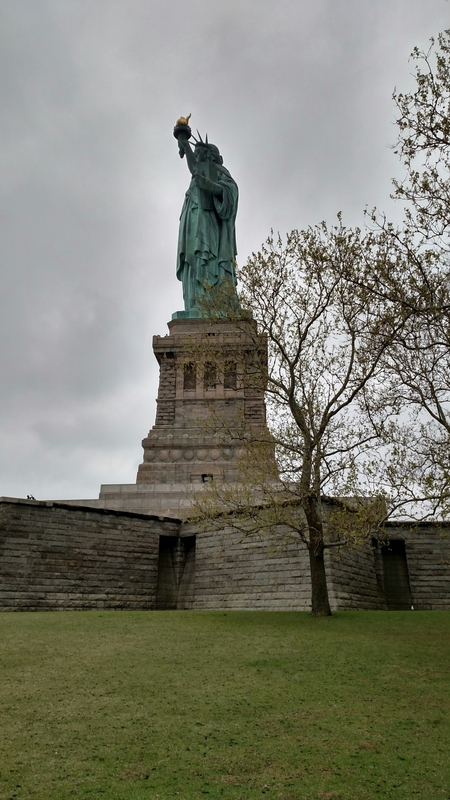 The thing I find really special about visiting the statue in person is the many different angles you can view it from while on Liberty Island – angles you don’t usually see in picture books, angles that catch you by surprise as you’re walking along, breathtaking angles that drive home just how massive the statue is. It has an occupancy limit bigger than many New York restaurants (there is a staircase inside that you can climb right up to her crown). Talk about getting inside someone’s head! I went through three different Security checkpoints during my visit, and only those with advance reservations (which I had) can go into the pedestal. A ticket to climb up inside the statue requires a special reservation (which I didn’t have) planned months in advance (and, of course, another security check). I had to take my belt off at every one, and was beginning to feel like a stripper. I would have left my belt in the room if I didn’t need it to hold my pants. 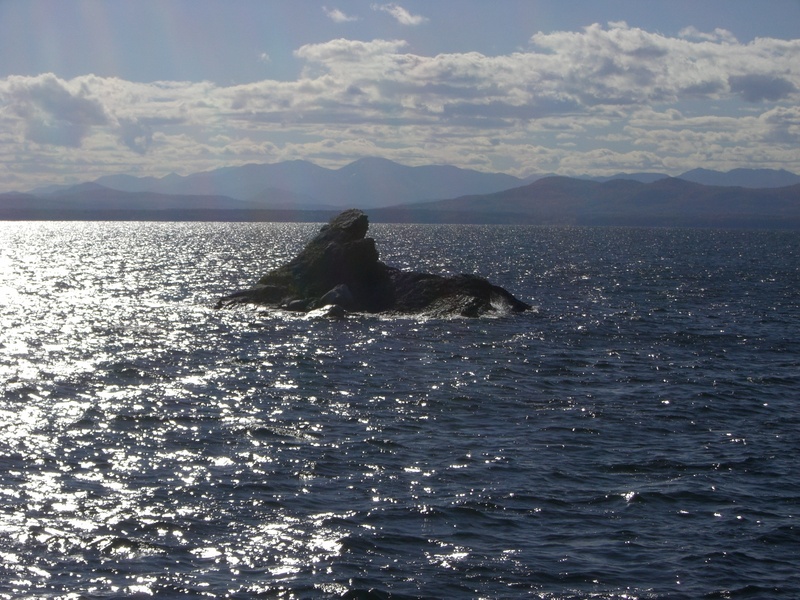 The boat ride to the statue was pleasant and offers some dramatic views. I felt a little bit like Barbra Streisand in “Funny Girl” (Don’t rain on my parade – but it did). 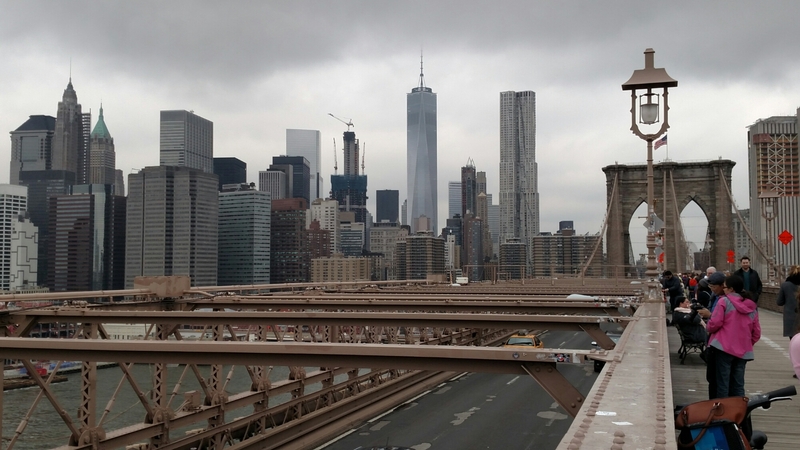 This is the same view that millions of immigrants had when they first came to America, a whopping first impression that told them that everything they heard about America was true – it is big, it is grand, it is the land of opportunity. The pedestal the statue sits on is almost as tall as the statue itself. 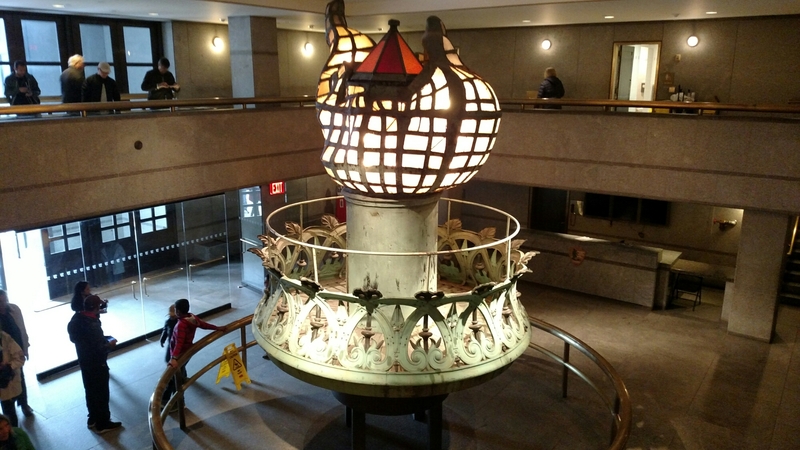 There’s a museum inside that includes the original torch, which was replaced a number of years ago, as well as a registry of names of people who donated to the statue’s restoration for its centennial in 1986. When I saw this display I had a vague recollection that I had contributed money to this cause years ago, and sure enough, when I looked up my name on the computer, there it was. It was an unexpected surprise. It would have been really neat if my name was etched in a wall or something, but I didn’t give that much money. 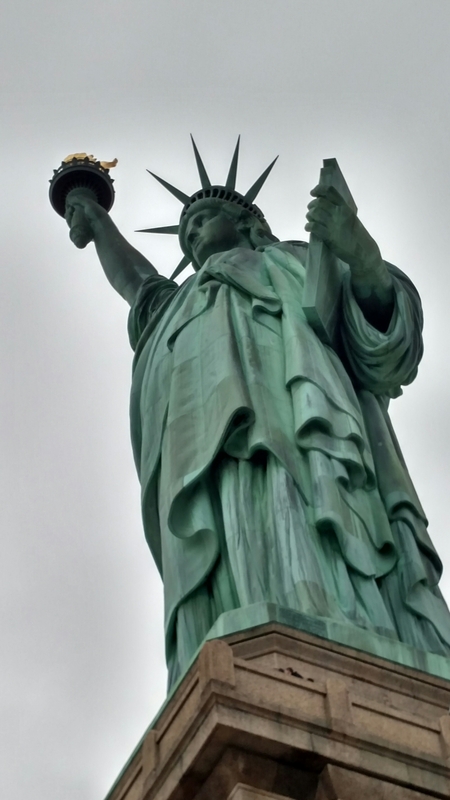 Probably the most moving part of the trip for me was when I was standing right in front of the statue, looking up at it with my binoculars. It gave me a feeling for just how big it is but it also filled me with a sense of pride and wonder, not just in the country but in the human ingenuity that could envision and build such a thing. It brought tears to my eyes, as a grand accomplishment always does, which even the operas I’ve attended haven’t managed to do (yet – La Boheme is Thursday night). 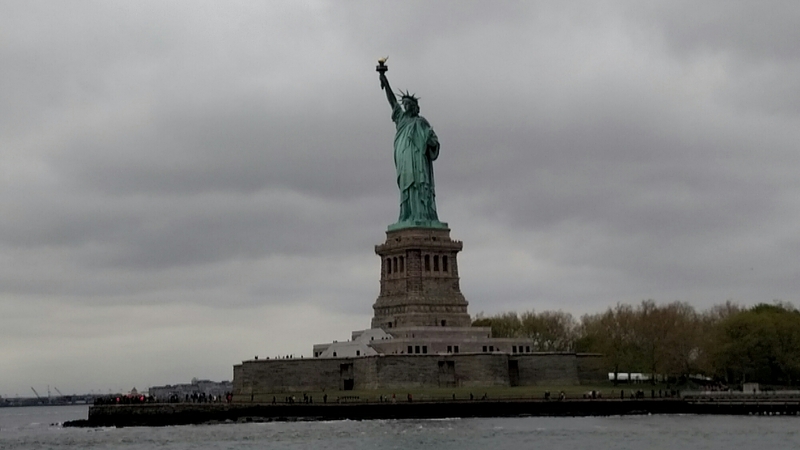 After this experience I took the boat over to Ellis Island, something I had never done before. The museum there was very impressive, and gave me a real feel for what immigrants experienced when they stood in the very same spot I was now standing. So much history in that building. The restoration work they’ve done on it is fantastic, as evidenced by the before and after photographs. It looks today just as it looked in the early nineteen hundreds, with faithful reproductions of ceilings, floors, rooms and hallways. 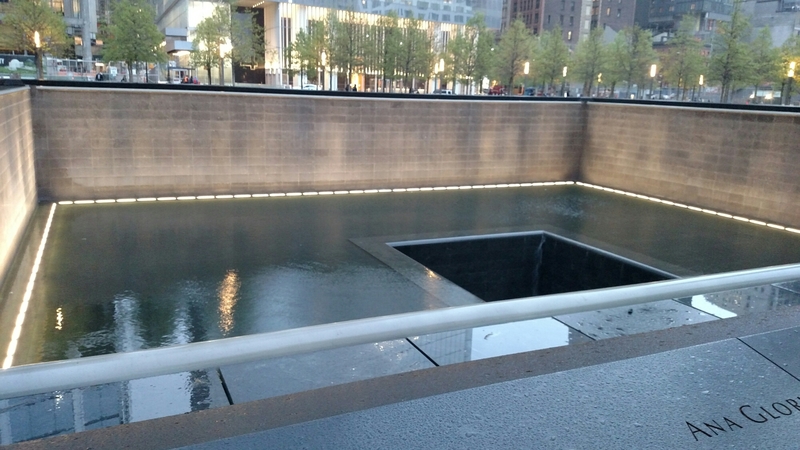 Somehow I didn’t find the reflecting pools that now inhabit the exact footprints of the twin towers as moving as I expected, perhaps because the waterfalls weren’t running, and running water always invites reflection and introspection. 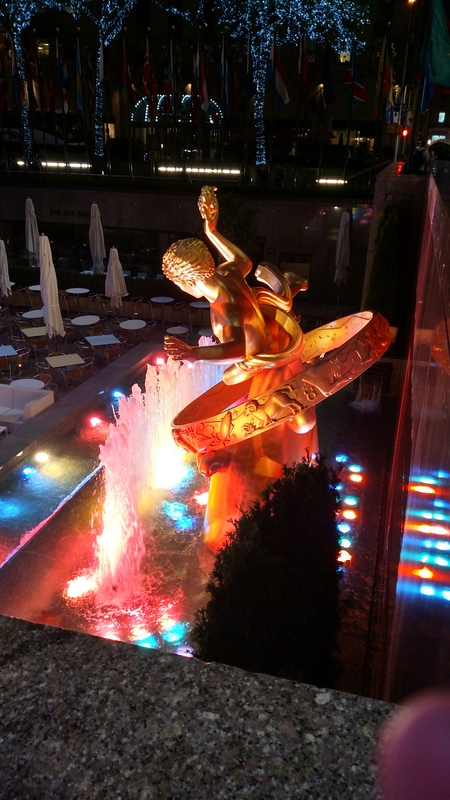 I plan on visiting again tonight, in the ambience of the lighted pools and names, and hopefully flowing water. I did find it moving that some of the names carved around the memorial had American flags, flowers and other mementos placed by them, just as you would find at a gravesite. 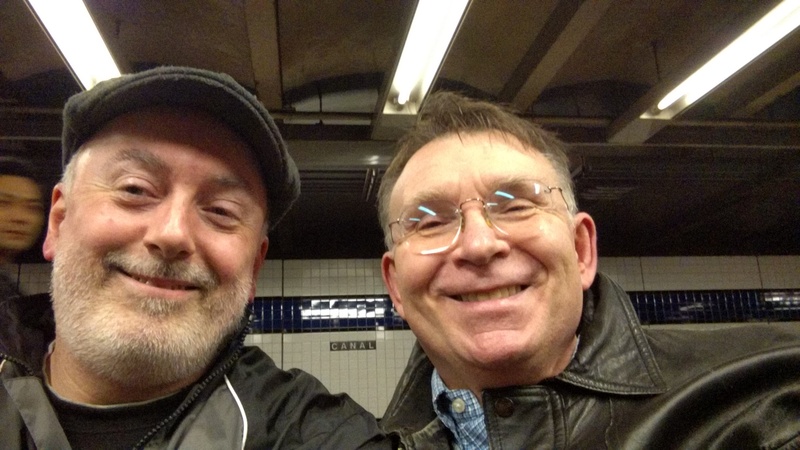 After all this adventure I got together again with my friend Michael in the evening and visited Chinatown, where we had a great meal and great conversation. We walked through the streets of Chinatown and Little Italy afterward before we parted ways. He’s leaving the city tomorrow, as he likes to get out of here every chance that he can. Here I am marveling at every corner of the city this week in true tourist fashion, but his perspective sheds some light on what it’s actually like to live here. The noise. The tourists. The inconveniences. The need for personal space. There is definitely a price to pay to live in such a marvelous city, but it sure is a nice place to visit. Today was a museum day, partly because it rained, and partly because I’m very tired of walking the streets already (I overdid it yesterday). The problem with this plan was that I ended up doing a ton of walking anyway, and in the rain. 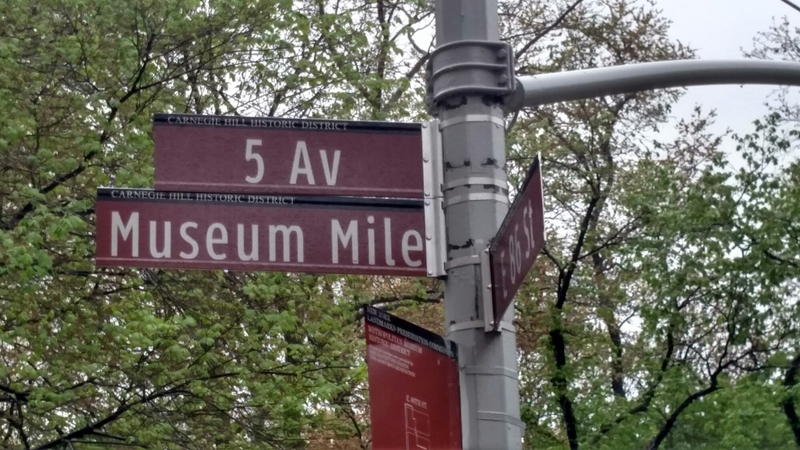 Twice now I have tried to cut through Central Park to get to the Metropolitan Museum of Art, which is about the only direct way to get there from my hotel. It looks simple enough on a map. But both times I ended up going in a loop (the park is huge and meandering) rather than a straight line and coming out pretty much where I started after a good 40 minute walk, and mind you every step of that walk was somewhat painful. I finally found the museum after a walk that was twice as long as it should have been, so I was a little cranky and wet and tired by the time I got there. The museum is, of course, magnificent. It’s cavernous. It’s overwhelming. There are so many rooms that I suspect I only saw about half of them in the five hours I was there, and many of those I raced through because I was mindful of the time. 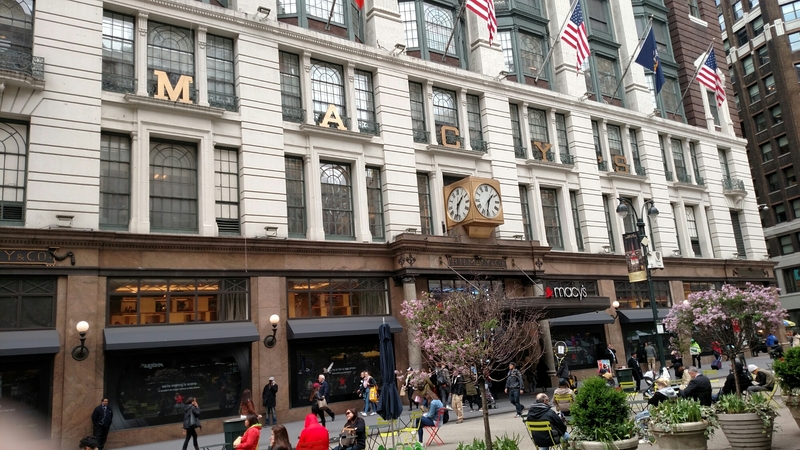 The museum did remind me a bit of being in Macy’s in that once I was inside, I couldn’t figure out how to get out. Someone could have offered me $500 to find them an exit and I don’t think I could have done it. The other thing I couldn’t find was a scrap of anything to eat or a restroom (actually, this has been a problem in general the whole time I’ve been here). In this sense the museum is not very patron-friendly. But that was all made up for by the stunning artworks the museum possesses, over a hundred and twenty of which I took pictures of (see my Facebook page for today). Yeah, I was that guy. But I had tons of company, and at least I wasn’t stupid enough to use flash. 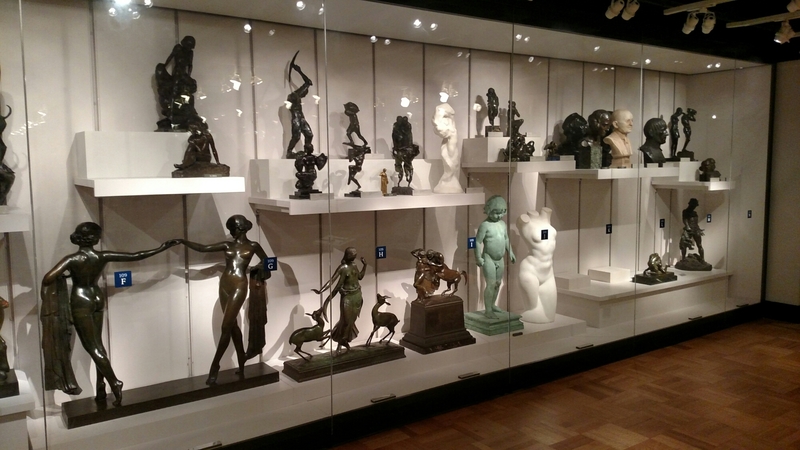 I might be from Eastern Connecticut, but I know a few things about being in museums (I probably used flash last time and got yelled at). By the time my museum gawking was winding down I was extremely tired and extremely hungry. I did manage to find something to eat about three-quarters of the way through my visit. It was a $7 peanut butter and jelly sandwich that was the worst one I have ever eaten. I don’t know how you can ruin a peanut butter and jelly sandwich, but they managed, and my $3.50 cup of coffee was so hot as to be undrinkable and un-holdable. Plus there was nowhere to sit. So imagine my delight when I noticed a comment card on one of the tables. I asked them if they hated their customers. When I left the museum I found a hot dog vendor on the street, and to my groaning stomach it was filet mignon. It hit the spot, and was enough to fuel my walk back to the hotel – which I didn’t screw up this time. I had a whole hour to rest and shower before heading out to my second opera of the week. 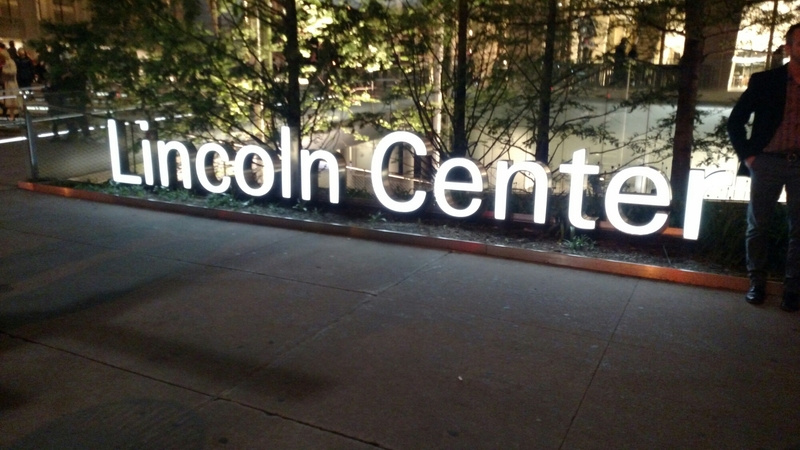 Luckily, I can leave my hotel and be at Lincoln Center in less than ten minutes. 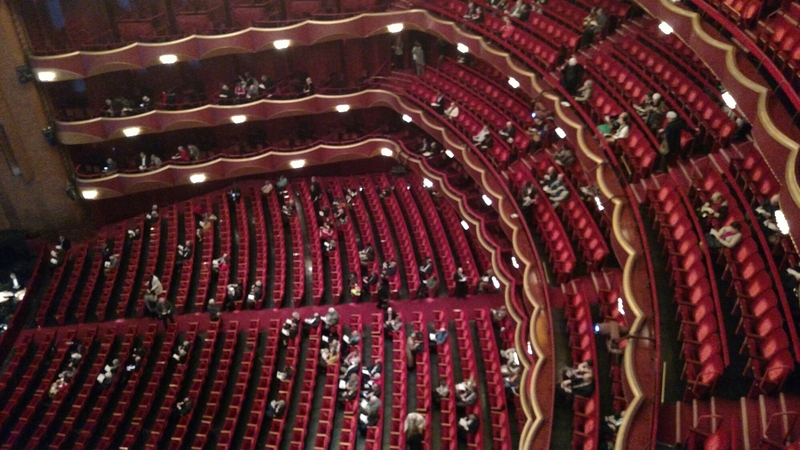 The opera house is gorgeous and elegant. Everything is decked out in red velvet, including the walls and the railings, accented by rosewood and stunning chandeliers that rise out of the way when the show begins. I think the house seats somewhere around 3,000 people, making it the largest opera house in the world. This opera was a bit special in that it’s one of my favorites, and in that it was being conducted by James Levine, the aging, beloved, and soon-to-be retired musical director of the opera house for the past four decades. It was a treat to see him there. He is now in a wheelchair and hasn’t conducted many shows lately, but this is also one of his favorites. He received a warm and thunderous ovation, not once but four times during the evening. They built a special ramp and conductor’s podium for him to accommodate his wheelchair. 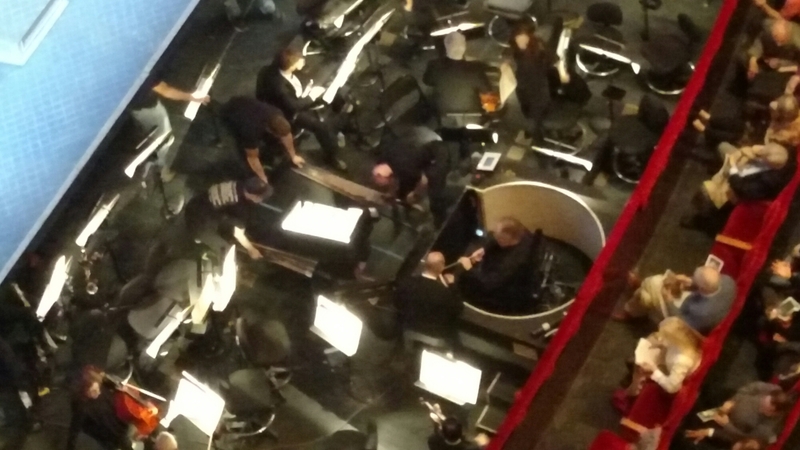 The audience loves him and so does the orchestra, so they go out of their way to take care of him. The opera itself is not one of Mozart’s most popular, but I think the music is fantastic. It’s not a serious opera. There are a lot of lighter moments mixed in with gorgeous and uplifting tunes (one of them, the rousing “All hail the mighty Pasha Selim,” is my cell phone ringtone, below). The story concerns two refined British women who find themselves in a Turkish harem after their ship is seized by Pirates. Their beloveds were also taken and separated from them. The rest of the story concerns the effort of the men to rescue the women, even though the women have been given to the Turks as concubines. The opera was featured prominently in the movie Amadeus, which is where I first encountered it. The music struck me even back then when I wasn’t into opera at all. It was a magnificent show. The costumes were gorgeous. 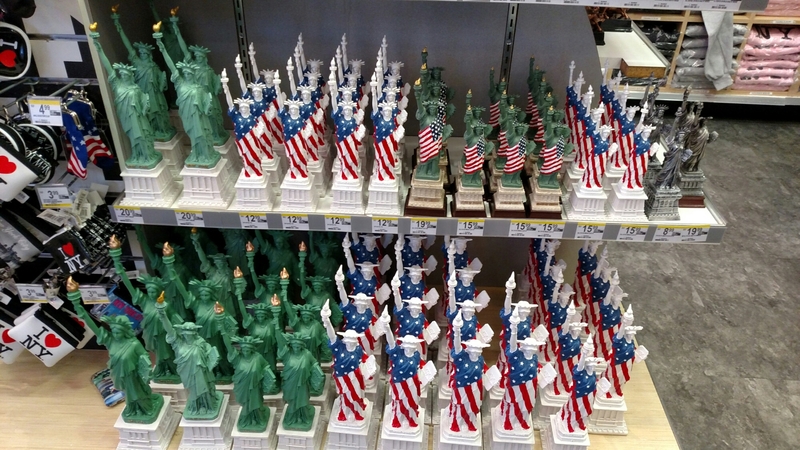 Tomorrow I visit the Statue of Liberty and Ellis Island. 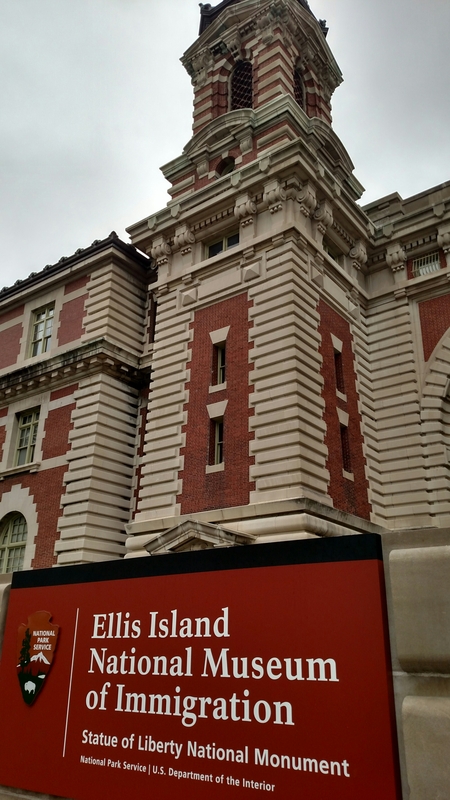 While I’ve seen the statue before, Ellis Island will be a new experience, and I suspect a moving one. 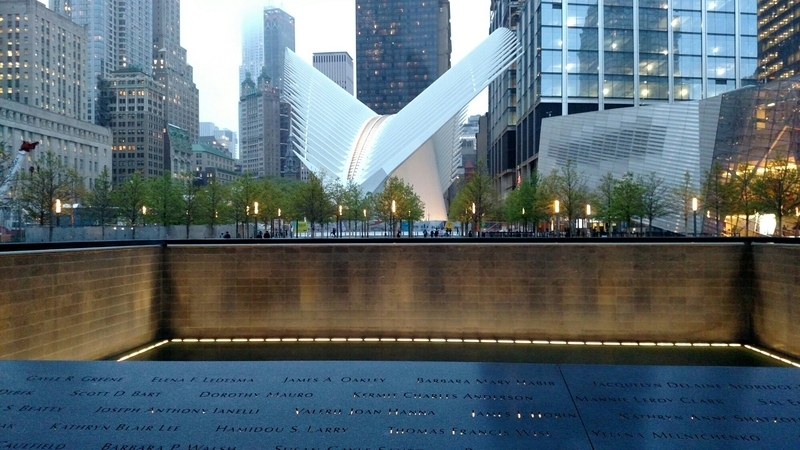 I may also try to squeeze in the 9/11 Memorial if there’s time, which of course will be more moving still. I’ll report back tomorrow night after what will probably be an emotional day. Having an amazing time in New York. I’ve only been here a day and a half, but it feels like much longer. The pace is of course very different from back home, and I did pack quite a bit into today’s itinerary. All in all I walked from my hotel on 87th Street all the way down to 34th Street, stopping at many attractions along the way. The weather turned really pleasant in the afternoon, which was a nice change of pace from how overcast it’s been. I started the day having breakfast at Hot and Crusty, a cool bagel & sandwich shop that’s open 24 hours in my Upper West Side neighborhood. I then headed over to the Metropolitan Museum of Art via Central Park. It was a little overcast, but the park is fantastic (and huge) with many species of mature ornamental trees and great, picturesque spots to sit (and dogs are allowed!) What an amazing respite for the city folk. Finally made it to the Met after taking so many meandering turns in the park that I ended up on the same (West) side that I originally started on, which was not my intent. After what seemed like an hour-long walk – and well may have been – it turned out the museum was closed for some big gala they’re having this evening (! ), so I’ll have to save that for another (rainy) day. 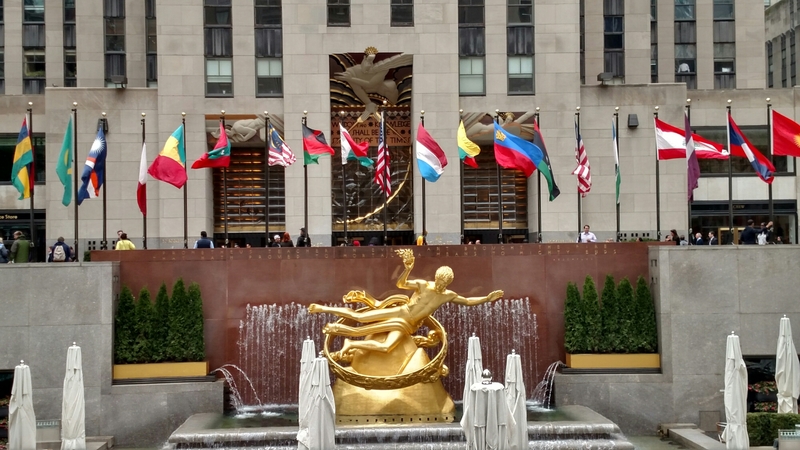 Instead I took a stroll down 5th Avenue, encountering many attractions along the way including Trump Tower, Rockefeller Center and Saint Patrick’s Cathedral. 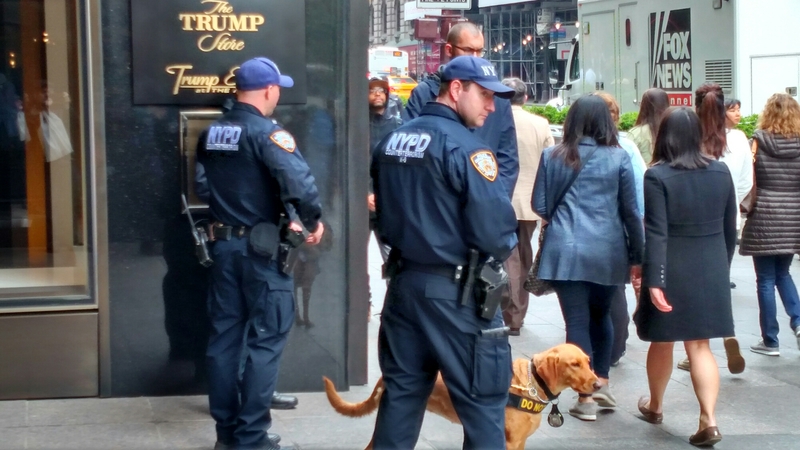 There were many police around Trump Tower, no doubt because of Trump’s presidential aspirations. The building itself is extremely tall and slender, and the lobby reminded me a bit of the casinos back home in terms of decor and extravagance. 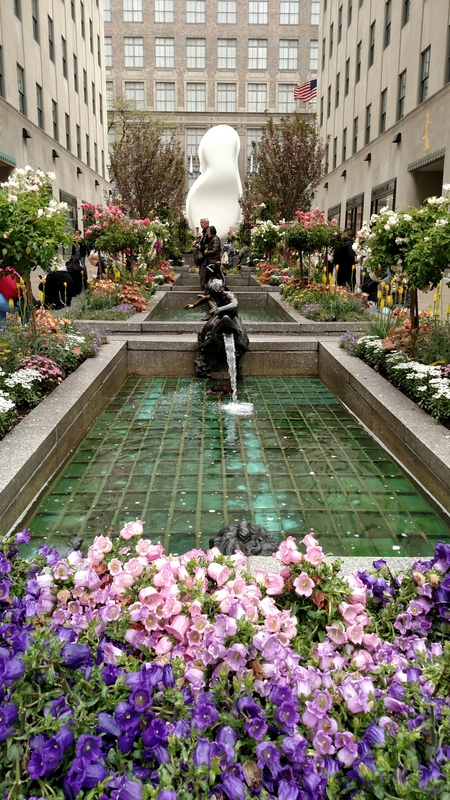 Rockefeller Center had many gorgeous water fountains and flowers, which made for a pleasant place to rest. The Cathedral of course is stunning in its cavernous size and grandeur. There’s even a gift shop inside, which is a little surrealistic for a church, and places to donate money every six feet or so. 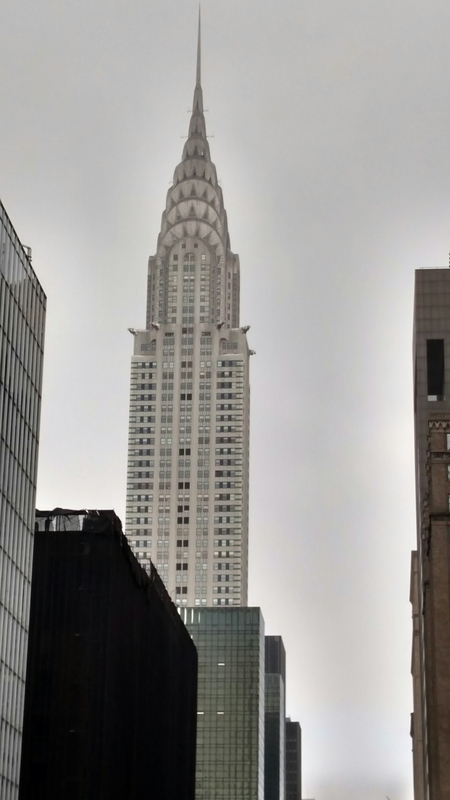 I also stopped in the Chrysler Building, which has a very 1930s-looking Art Deco exterior and interior, but unfortunately only the lobby was accessible to casual tourists. Checked out the New York Public Library also, with the slight disappointment that the famed main reading room was closed for renovations. 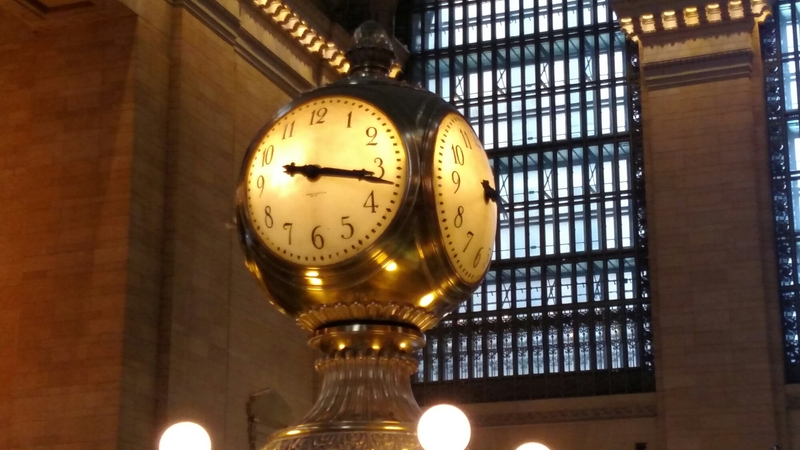 Then headed over to the cavernous Grand Central Station to admire its renowned beaux-arts decor. I was rather tired after all this walking by late afternoon, but thank God I brought the right pair of shoes – the same ones that I wear at work, where I also do an enormous amount of walking. So I stopped at Hot and Crusty again for a delicious BLT and headed back to the hotel for a shower. 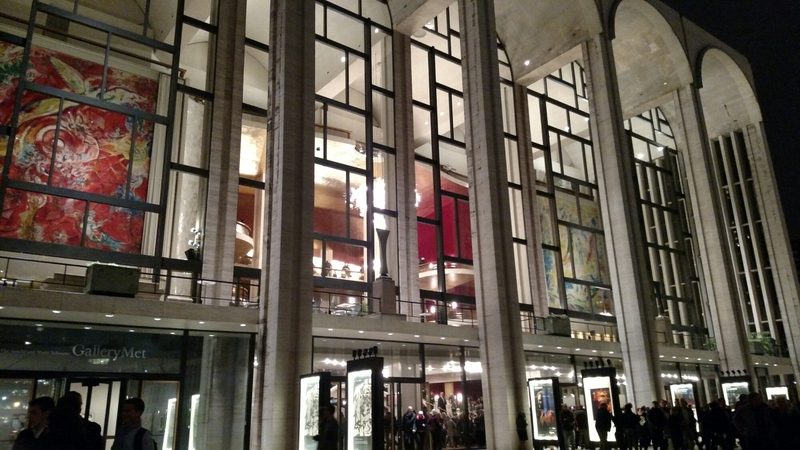 Then I jumped on the “1” train to Lincoln Center at 66th Street, which is only 3 subway stops from my hotel, to see the first of three operas this week at the Met. Being there is an amazing experience for me. 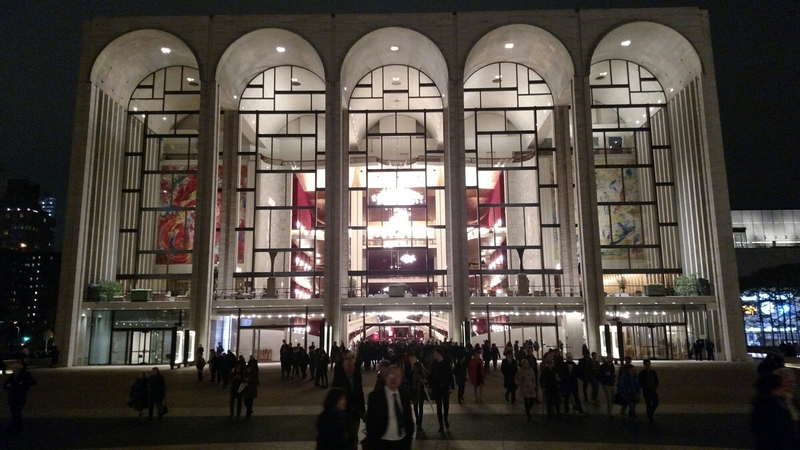 It’s one of the best Opera Houses in the world (and the biggest), and as a Met Opera On Demand subscriber I have watched many telecasts from this very House, so I feel like I know it. I listen to opera almost every day on my ride to work, but it’s always special to hear one live, which in tonight’s case was Otello by Verdi. It was a real tragedy. Literally. A Shakespearean tragedy, with lots of drama, cymbal crashes, and a duet that was so sublime that it almost lulled me to sleep – not from boredom, but shear loveliness. The ovations were long and deserved (my phone battery died on me from overuse today, but I’ll have pictures of the gorgeous opera house tomorrow). Things have changed a lot since I was here last (probably about 15 years ago). For one thing, just about everybody you encounter on the street or subway or restaurant or anywhere is buried in their smart phone, either listening to music or texting or on Facebook. I must admit I am guilty of this myself – smartphones are amazingly versatile devices that make life so much more enjoyable – and I don’t see them as an evil. It’s just something I’ve noticed. Everybody’s in their own little world, which makes the introvert in me grin knowingly. 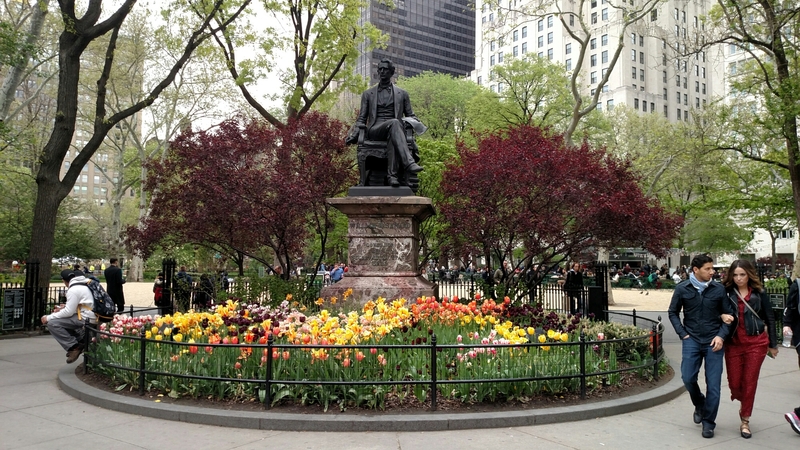 I kind of wonder what New Yorkers did before smartphones. I don’t think they really talked to each other then either, so it’s probably not a bad trend. The city seems safer than the last time I was here in the late 90s, and I’m sure much of this is due to 9/11. There is a much larger police presence, and you seem to get scanned just about everywhere you go, including Saint Patrick’s Cathedral, the library, and the opera. Times Square has definitely changed, with much of it now blocked off creating a large pedestrian area which is really quite nice. 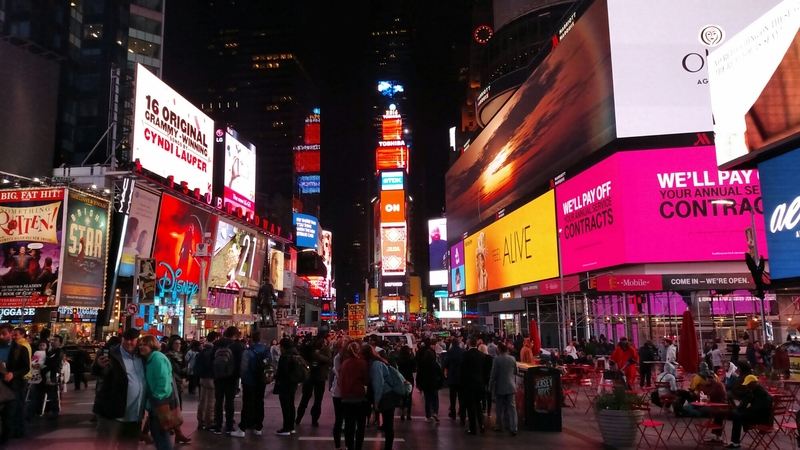 There are many places to sit and absorb the experience of being at the Crossroads of the World, checking out the amazing billboards and engaging in some of the best people watching anywhere. Before all of today’s excitement I got together with an old friend last night whom I hadn’t seen or talked to much in almost 20 years. You never would have known because we picked up right where we left off, just like always seems to happen with true friends. He treated me to a nice quiet meal in a restaurant that was fairly deserted, and we caught up on twenty years of life (neither of us has changed much – I don’t know if that’s good or bad). One thing I notice about New York is that although everything here is huge, such as the buildings and the Avenues, space is so expensive and at such a premium that I feel cramped everywhere I go, most noticeably in restaurants, where tables are extremely close together, and hotel rooms, which are tiny. My hotel is interesting in this regard as the designers seem to have made efficient use of every possible inch of space. The hallways are extremely narrow and mazelike, such that you have to turn numerous times to get to your room. The room itself is extremely small and there’s not a bit of wasted space anywhere. Dresser drawers are under the bed, and the bathtub is sized for a midget. It’s not like the wide-open spaces of Eastern Connecticut. I feel like I have adapted quickly to being a New Yorker in terms of riding the subway (I’ve got it down to one swipe of my MetroCard), crossing the street (I don’t always wait politely for the walk signal if no traffic is coming) and just walking around as if I belong here (I do). I’ve even learned to ignore people like a pro. 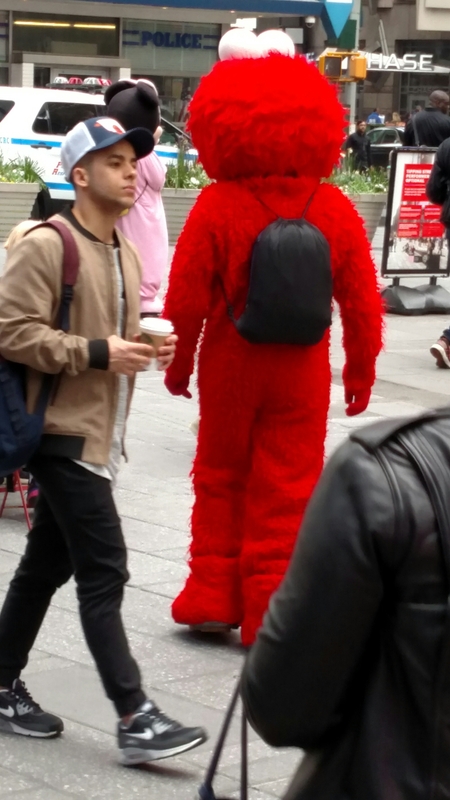 There are plenty of tourists around though, so I certainly don’t feel out of place at those times when I feel like one. Everybody’s taking pictures and looking up and marveling at the amazing eye candy that is everywhere, and I’ve seen numerous cases of New Yorkers really helping tourists out. As an introvert it doesn’t bother me at all to be here by myself. It is nice, however, to have the connection of one or two friends in the city that I could rely on if I had to, and also to have the connection or sharing my pictures and experiences on Facebook. It’s enough for me without being overwhelming. My neighborhood is very safe and there are all kinds of people walking around at all hours of the day and night. The subway does thin out late at night, but even then there’s just your Average Joes riding the train to get home, just like myself. There’s almost a feeling of “We’re All in This Together,” and that may also be a residual of 9/11. However I’m also a realist, and I do monitor my surroundings for safety. Could I ever live here? I’ve often felt that I could. I would love the cultural opportunities (symphonies, operas, plays, shows), and nobody seems to think anything of you living in your own world if you choose to at times. But as I learned a number of years ago, it’s very different visiting a place and living in it, so for now I’ll just be content with my week. More on that as it progresses. Got more intimately acquainted with Vermont today, from the northwest corner up by Canada to the capital region mid-state to Southern Vermont, where I’m staying now (this room is sweeeet! They upgraded me to an oversized room, so for my $95 I’m getting a massive, well-appointed room with two double beds, a fridge and microwave, coffemaker and hair dryer (ha! like I need that…..). Nice place. If the internet connection worked better, it’d be perfect. Started the day by heading north to the Ben & Jerry’s factory tour (complete with cow puns…. moooooove to the front of the room….) I was struck by how small the facility was, compared to my expectations. I thought it would me massive. They can crank out 150 pints a minute, but it still looked like a small operation. We got to sample the flavor of the day, Chocowlate, which is vanilla ice cream with chocolate cow pieces. It was good, of course. I picked up a pint for you all, but they were melting in the car so I had to eat them. From there I drove all the way up to Burlington, about 40 miles south of Canada. 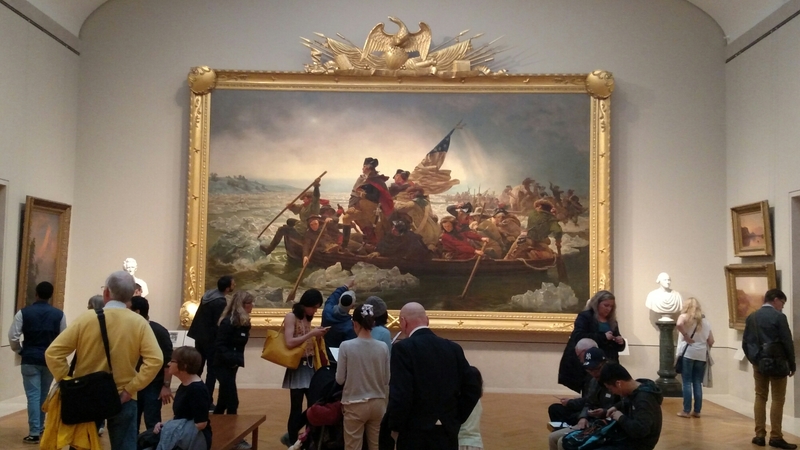 Aside from my boat ride (see below), I wanted to visit the small National Guard museum in Colchester, VT for one reason – to see the Merci Train. Let me explain. A coworker of mine is a history buff and lecturer, and he told me about the Merci Train. After WWII, the people of France were starving. The American people sent boxcars full of food and provisions to France to help. The French were so grateful that they returned the favor a year later and sent 49 boxcars – one for each state – filled with gifts to say thank you (“merci”). These boxcars were the same ones that transported troops and horses during the war (they are called 40 & 8s, as they held 40 men or 8 horses). They were built in the late 1800s, and hold strong memories for many servicemen who traveled on them. Thought they had little to give after the ravages of war, the French people gave whatever they could. The “Merci Train” arrived in New York, and made its way around the country, dropping off a car in each state. Many of these boxcars still exist (check mercitrain.org to see if your state’s does. Connecticut’s does not). They don’t contain the gifts anymore, but many have been restored. My coworker, who travels the country, has visited and photographed many of them, but hadn’t seen Vermont’s. I told him I would try to check it out for him and bring back pics (see them on my Facebook page) as it was only ten minutes from where I was already headed. While it may not look too impressive, it’s the sentiment that matters. As my coworker points out, France is the only major world player of the last few hundred years with whom we have never been at war. We have been staunch allies through and through. So why don’t we like each other more now??? Next I headed south (I’d have gone north to Canada, but my passport is not current). I stopped at the Vermont Teddy Bear Company for their tour, which was fun (it also had puns…. bear left…..). Their bears are nice (and expensive….most were $50! ), and are guaranteed for life (most common mishap: dog chewings… hear that Marley?). They have a full-time woman who repairs returned bears, whom we met. The bears’ eyes cannot be pulled out (safety feature), they will not burn (they melt instead), and you can have bears custom made or dressed. Valentine’s Day is the biggest bear-giving occasion, and “will you marry me” the most popular custom embroidery. End of bear trivia. Continued further south to Montpelier, which I did not have time to check out last night even though I stayed near there. Wanted to visit the state capitol building. 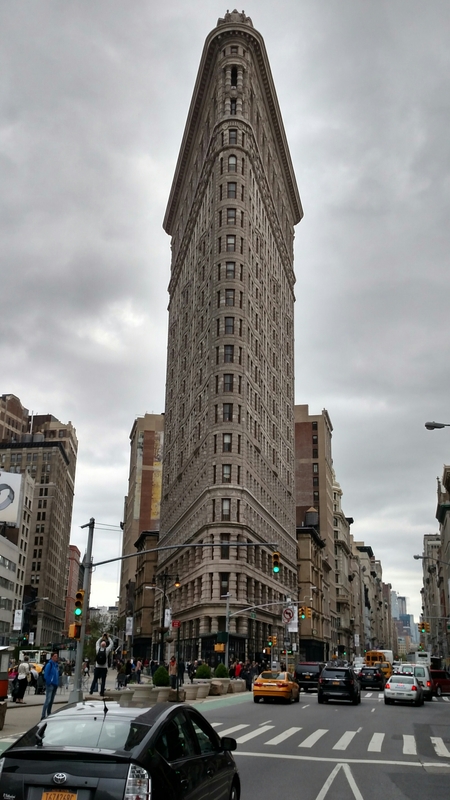 I find these buildings fascinating – the architecture is marvelous (esp. true in Connecticut’s case), and I have a gorgeous book with great photographs of every state’s building, inside and out. Most are jaw-dropping in their grandeur and lavishness, yet how many of us have seen them? It is my goal to see as many as possible when I travel (I saw New Hampshire’s a few days ago). Montpelier was a hoot…. it is so small! (I almost missed the exit as it looked like there was nothing there). It felt kind of like New London, and the capitol building just sits there on the small-town street grid, unassuming yet majestic. I pulled up right in front. It was dusk, and the place was pretty deserted so I felt as though I had it all to myself. I was impressed with the grandeur and size of the building, which stood out all the more so because of its location. The dome is gold and very shiny. The grounds were very nicely landscaped with beautiful mums (see pics). Sadly, I arrived too late to go inside (same problem in NH), but I was glad to have seen the outside. I like Vermont’s small-scale personality. It is the same size as New Hampshire, yet has half as many people (600,000 vs. 1.2 million. Connecticut has over 3 million and is of course much smaller). Its capital is the smallest in the country, and only one state has fewer people (Wyoming). Frequently on the side roads here, I was the only traveler (I think locals go to bed early). The people have been very friendly. Still, I think I preferred the White Mountain region of New Hampshire. The forest area (which was huge) and mountains there were beautiful and peaceful. Vermont seems to be more about trees, which of course is great in the fall , and skiing (which I‘m not into). I arrived here past peak foliage, but it was still nice. I think trees turned early this year. No problem, I’ll try again next fall. I’ve driven over 900 miles in the last three days (that’s over 16 hours in the car) and for the most part, didn’t mind any of it (there were a few exceptions, mostly long and twisty backroads, and that notable fiasco the first night in New Hampshire). My vehicle has performed admirably in spite of some abuses (the Mt. Washington climb and the rut-filled trek through the woods come to mind). Twice I came within 10 miles of running out of gas (even on the interstates, the travel services are few and far between), and both times a gas station appeared like an oasis in the desert just in the nick of time (thank you, universe!) And fortunately, it is impossible to lock my keys in my car. Modern conveniences have made travel so much easier and more pleasurable. GPS is truly amazing and has been indispensable. I love the fact that it shows the speed limit of the road you’re on and how fast you’re going (kept me from getting tickets), I love the very accurate estimate of arrival time (helped me plan my stops), and the instant adjustments to my errant turns (either intentional or not so). It never failed to direct me from here to there and is a remarkable invention. It gave me confidence to go all over the place effortlessly and without worry. It made planning easier (will I arrive in time? Which lane should I be in?) If you don’t have one and travel at all, they’re worth every penny. Equally great was the new device I got to connect my mp3 player to my car stereo, allowing me hours upon hours of my favorite music playing automatically and randomly, my own private radio station of my favorite tunes. It made the time pass very enjoyably. Lastly, the ability to get on the Internet from the road is a godsend to an Internet junkie like me. I can’t go a day without it, and many hotels now offer access, as do most McDonalds and other fast food joints (I brought a list of all the McD’s in the area!) Someday, the whole country will be wireless. I didn’t mind traveling alone, largely thanks to these devices (along with my cell phone and digital camera, more modern marvels). I didn’t feel alone. I felt connected, which engenders confidence and safety. This is not to say that I don’t like traveling with others, because I do. But this was an abruptly planned trip, and I’m not sure that my historical itinerary would have been of interest to those I might have asked to go along. I got to do whatever I wanted to, which was liberating if a bit lonely at times. I would like to travel more, and certainly have the time now (I work every other week). Mostly area road trips of a day and occasionally more. I like traveling by car (as opposed to plane), it’s so much more convenient to have your own vehicle with you and to be able to take whatever you want with you. I wish I had a bazillion dollars so I could do this more often. I’d travel the whole country and visit every state.